The packing list is often seen as an afterthought, a triviality, and a nuisance. It is the lowly packing list. It doesn't get much respect, and it is begrudgingly issued with the details necessary to make it a useful document to the exporter, the importer, the freight forwarder, and the customs broker. But the shipping packing list deserves respect! The details that are necessary include the package count and type, the dimensions and the weight of each package, the cubic measure, the marks and numbers of each package, product description, and a reference to the line item on the commercial invoice. It is a count of the product being released and shipped to the buyer's facility. It supports the issuance of the inland bill of lading. It identifies detail required for a certificate of origin. It provides the detail required by the law for the Electronic Export Information filing in the Automated Export System (AES). It supports issuance of a Material Safety Data Sheet if the goods are deemed hazardous. It is used to create a booking with the international carrier and subsequently the issuance of the international bill of lading. The importer's customs broker will use it to enter the goods into their country as it contains required detail. In the event of loss or damage to the goods while en-route, it becomes a document that will be used to support an insurance claim. It provides the buyer with the ability to accurately tally the product that they receive, and subsequently reimburse the exporter (seller) of the goods. It may be used in support of reimbursement under a letter of credit. 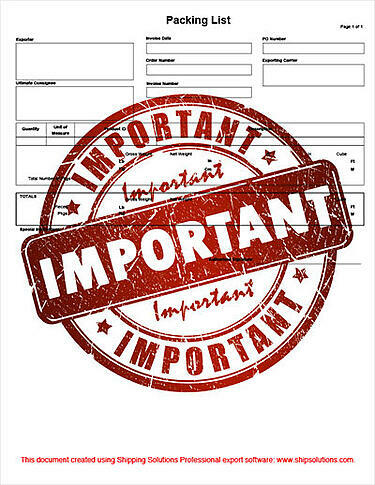 If your company needs a template to issue this document, it can be found here. To learn more about packing lists, check out our comprehensive resource for all exporters, Export Procedures and Documentation: An In-Depth Guide.